Shechen Monastery (Tib. ཞེ་ཆེན་, Wyl. zhe chen) — one of the Six "Mother" Nyingma Monasteries of Tibet, was founded in 1695 by Shechen Rabjam Tenpé Gyaltsen who was sent to Kham with this purpose by the Fifth Dalai Lama. Shechen Monastery became, gradually, the head of a network of around one hundred and sixty satellite monasteries situated all over the Himalayan region. Rapidly becoming renowned for the authenticity of the teachings at its shedra and for the quality of its sacred arts, it became one of the six main monasteries of the Nyingma tradition. Many great masters came forth from Shechen Monastery including Shechen Gyaltsab, Shechen Kongtrul, Khenpo Gangshar, and the sage Mipham Rinpoche. Dilgo Khyentse Rinpoche, Chögyam Trungpa and many other important 20th century teachers received teachings at the monastery. In 1980, in exile in Nepal, Kyabje Dilgo Khyentse Rinpoche began the building of Shechen Tennyi Dargyeling Monastery in Baudhanath, Kathmandu. Intent on preserving the extremely rich artistic tradition of the original Shechen Monastery in Tibet, Kyabje Dilgo Khyentse Rinpoche supervised all the aspects of the work with the greatest attention to detail. Magnificent paintings cover the walls of the main temple and one hundred and fifty statues were made for it by the best Tibetan craftsmen and sculptors of the time. 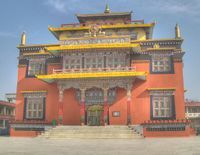 The monastery hosts an important Tibetan library, the Tsering Art School for the preservation of Tibetan culture and sacred arts and a shedra. More than three hundred monks live at the monastery and receive an education which, apart from philosophical teachings, comprises traditional music, dance and painting. The abbot of Shechen Monastery is the seventh Shechen Rabjam Rinpoche. ↑ Some sources say it was established by Gyurme Kunzang Namgyal, the second Shechen Rabjam Rinpoche, in 1734. This page was last edited on 8 April 2018, at 07:33.